Delhi University Admission Form 2017: Delhi University is all set to start the admission process for the academic year 2017-18. DU Admission Committee has decided that the varsity will begin the Undergraduate admission process from May 22. Delhi University Admission Forms 2017 will be available online only from May 22 to June first week. The DU Admission forms for Sports and ECA (Extra Curricular Activites) will also be available online only. The fees of the application form for General category applicants and for reserved category will also be announced very soon. The offline admission forms will not be available this year. The registrations are kept ‘online only’ as per the instructions of UGC. DU is expected to release five cut-off lists this year. The first cut off will be out in the last week of June. Delhi University has 70 colleges affiliated to it. The cut-off lists will be available on Delhi University website www.du.ac.in, the individual DU colleges’ websites and http://duadmissions.co.in. This year, the DU college admission fees will also be received online only. The students won’t have to get any Demand Drafts. Delhi Universtiy enrolls 54,000 students every year in various courses such as B. A, B.Sc, B.Com., the centralised admission would make this process very smooth and easy. The students will only have to visit the colleges to submit their Class 12th certificates and fee receipts. The original documents will then be verified and admission will be granted. The University carries out entrance exams only for Management courses. The courses include BBE (Bachelor of Business Economics), BMS (Bachelor of Business Studies), BBS (Bachelor of Business Studies) etc. The DU syllabus for the entrance test for UG courses is based on the academic syllabus of class 11th and 12th. The registration for entrance based exams begins from 31st May, 2017 along with Postgraduate and M.Phil. and Ph.D courses. A separate form is required to be filled to get into these courses. The admissions are provided on the basis of the merit. But since only a few DU Colleges offer these very sought after courses, the competition is very high. Some of the most prominent Delhi University colleges for these courses include Shaheed Sukhdev College of Business Studies (CBS), Gargi College and Deen Dayal Upadhyay College. 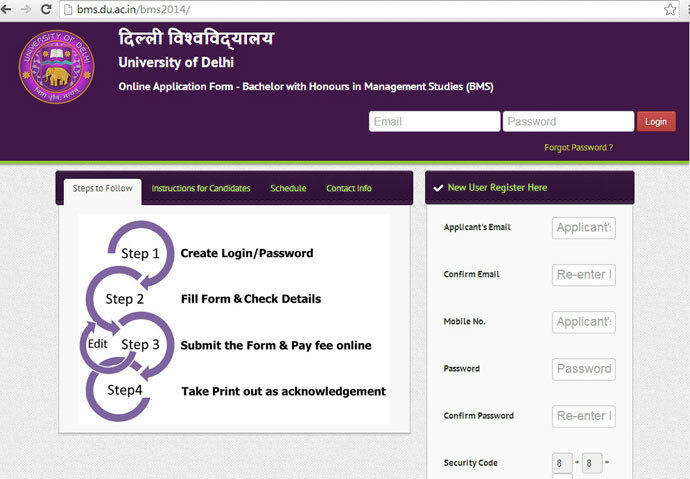 DU opens up its online registration process from May 22. Fill the DU Admission Form 2017, make sure you check all the fields twice before submitting. Make the online payment, which is going to be somewhere around Rs. 100 for general category students and Rs. 50 for others. Take a print out of the form and the payment receipt. Check out the screenshot of the online application form below. Hope you found this article helpful. If you have any other query related to Delhi University Admissions feel free to reach us at [email protected] or you can comment below, we’ll try to get back to you as soon as possible. Also don’t forget to subscribe to our website and like our facebook page to get all the DU Admission Updates instantaneously. if the admission process begin from may 25th then when will the registration to du begin? Hello Yash, the registration forms will be available from 25th May only. Feel free to contact in case of any other query. is there something we have to do before may 25th and i also want to know the list of documents or other paperworks that i need to compile before registration process begins. i can’t get my intermediate second year certificates by then, what should i do? We’ll be posting a complete list of documents required at the time of Admissions 2016 very soon. Do like our facebook page and subscribe to the website to receive the list right in your inbox. Which documents do you have at the moment? i have cbse mark sheet, migration and study and conduct belonging to my 10th standard. i do not have anything that belongs to my intermediate second year. i want to pursue BA Hons in Pol.Sc! but want to keep my options open for history and geo too! what steps should i take during the selection of courses while filling the form up? if i apply for more than one courses will there be any problem in taking pol.sc later? Sir i want to know the process involved to get in to DU . I also want to get in touch with some of the DU seniors. I want to know when PG online registration form available for Msc(chemistry). When ll PG admission be started? I cannot find the admission form for PG courses for 2016-17 online. Also, when is the last date for submission? Please reply ASAP. Thank you. Hello Medo, we’ll update you on the same very soon. hello! sir, my name is Krishna. I want to know , when’ll the admission process for PG couses began and what is the eligibility criteria. and what’s the admission fees should I give. when does du application forms for bsc are available for 2016 and what are the admission basis? Hello Kartik, the forms will be available from May 25. And for the eligibility we’ll be putting up an article on the same very soon. Like our facebook page and subscribe to our website to get the information right in your inbox. I want to apply in du in b.com i have jst passed 12th class this year….nd what the admission procedure accuring b.com nd how admission form will be filled with what the documents……??????? Please tell me that do We need to do anything before may 25 for UG admission in 2016 and how to apply forms for BMS in du plz kindly help. I wanna take admission for B tech in D.U. is there something which i have to do before 25th MAY.. ? Can I get apply for zoology honours in any of the colleges on the basis of my 12th class result? Or do I need to give any entrance exam? Hello Mohnish, Delhi University does not conduct any entrance exam for zoology hons. Admissions are taken on the basis of class 12th percentage. Sir, I have not taken Maths paper in 12th so can i get admission in B.com(Hons)? Is it any criteria for B.com(Hons) or B.com in DU? No. The eligibility for B. Com (H) program is that you must have studied Maths in your intermediate. You can select B. Com Program though. *Both the courses are different. When are the M.A. Psychology admissions opening? Is Delhi university entrance exam is mandatory for the admission in BA [HON] in English in the collages like St stephens or lady shriram collage? If its so,when the application forms will be available online or offline? when are the pg admissions going to start and should we check on the same URL for updates ? They haven’t give out notification regarding PG admission yet?? When can i apply? sir i ve got only 60%in my 2015 12’th exam …! sir i wanna apply for bsc(chemistry). sir can i apply or not…………..? hi sir, I’d like to know more of the eligibility to MA Economics in DU,do i need to pass through entrance exam to join the university…. Sir, i want to graduate from the mass communication course,, so can you inform me the process to get admission in mass communication in du? Sir, I want to know that when M. SC entrance date will come, for botany? i want to know from when the PG MA online registration form will be available? Hello, i am unable to get the application forms for PG. What site should I look up for? Hello, i am unable to get the application forms for PG. What site should I look up for? Please help! sir i want to know that do we need to apply for the colleges separately or just need to apply for du and rest will be done by them? i want to know when will be the application form PG made available? i want to know is DU is having the course of B.com with Computers. And also about hostel fee structure. Can i apply for both in du?? In news there is a discussion that result will come on 27th or 30 the may, then how can we apply before the result ? i want to know about DU CATE 2016 application form when will be available . After applying online on the DU site,do we require to visit or apply on specific colleges after cutoff list is released .If there is some centralized procedure for the same then please let us know. What is the criteria for ECA form category? Little assistance required – Applied Psychology (Hons) under CBCS system. How is it different from regular Hons prog.?? sir i want admission in du but i ve got only 61% in my 2016 12th exam …. sir can i apply or not?? Is there any entrance exam also or the admissions are only based on 12th standard %? Why application form are not available in offline mode? Does delhi unversity hold an entrance test for bcom(hons) and eco(hons)? i want to know the courses for which entrance exams are to be held? I am from rajasthan and student of 12th and got 97% in pcm I want to admission in bsc.admission is merit or entrance exam.important date send me please. hello..i already registered..but i havent got a confirmation mail yet.. will it come late..or should i be doing something else also? THANKS FOR THE INFORMATION POSTED HERE. I registered and filled all my details but when it asked to choose the course then only 3-4 courses are there to select. sir i want to knw that what documents r required along wid d form submission??? can student of other states like UP apply for DU college.? sir i want admission in du but i ve got only 73.60% in my 2016 12th exam …. sir can i apply or not?? Hello sir,I passed 12th last year with biology subject and in a hurry joined local college for bsc. I got 92.6% can I apply for UG course and do I need Gap certificate? And will the tc and migration certificate from my present college be accepted? please answer my queries. Sir I have given my class 12 in 2015 from Delhi … Soo am I eligible nd will my marks be deducted… Ug forms based in merit is from 25th may?????? Sir I have given my class 12 in 2015 from Delhi … Soo am I eligible nd will my marks be deducted… Ug forms based on merit is from 25th may?????? sir will i be able to get admission in delhi university??? Is admission for bsc(hons) for non- medical started??? I have cleared 12th with PCM and Eco in 2016 . What subjects are considered for calculating best of four. I got 93% in best of four . Can I get admission in B.A Hons. Eco in north campus. Dear sir,I am a nepalese and i want to know the process involved for my admission in BCom.I have cleared my +2 this year by CBSE board. In du’s website the online registration form is already available .. and this year are admissions being conducted only through entrance? Dear sir i want to ask that for persuing chemistry honors bsc i want best 4 subjects percentage or pcm percentage . I passed out 12th commerce stream 2016 from RBSE with 93% . Optional sub. r Accounts, Business studies & Economic ! I want to admission at Shri ram commerce college in B.com.I can get admission for B.com. ?plz replay. What is the Offline Procedure for the DU Colleges(Centralized Process)? hlo I got 92.4% in 12 n i want to do BA hons in political science from DU . I want to know that can i get d aission in top 10 colleges of DU ???? i want to do jbt from du… i got 62% from sci. stream….. can i get admsn in du?? I want to know that is there any entrance exam for bcom honours in SRCC? ?? SIr, pls confirm , whether the online centralised forms are availaible or not for non management cources of du? Does DU provide BCA course.? I would request you to help me to find out the link for the online application form for ug admissions 2016 to du. i am applying for B.A. hons. in economics. i would feel grateful if you could let me know whether I hold any chance of getting selected for the above mentioned course. I have secured 93.5% in my 12th boards(CBSE). its 28th may and still cant find any online forms other then entrance based and post graduation.. some say 25th others say 28th and now its 1st june. when is it out for real..?????????????? Sir,i want to do histroy honours if u could tell me wether its entrance based or merit based. sir meine pehle registration process pehle complete kr liya hai but mujhe yaad nhi aa raha hai ki maine kon si email id se registere kiya hai plzzzzzzzzzzzzzzzzzzzzz help me from where to get my registered email id ??????? i m science student but i have to opt eng hons. what formalities should i complete ??? Gud evening sir i want to take addmission in du and do biotechnology i am a pure bio student .how i can apply? Its addm. Is based on 12 th marks or it is entrance based? And what is full time fees for this course? Can a candidate include marks from both main marksheet and improvement marksheet at the time of admission in Du? sir/mam i want to do bcs hons computer science. is it mendatory to include mathematics for calculating best four percentage or i can skip mathematics for calculating percentage?? I Registerd our UG form but in column Last school Attendend I fill our School attendence (80%) So, this is major problem for admision or not please tell me. And i wnt admision in B.A prog i have 73% marks in 12th. sir i have filled six subjects in du online form .so, what should i do ? should I do registration again? How to scan and upload my 10th result as it is to long and after converting it into 200KB file pixels become so weak to visible. I’m from Bangalore, and wish to apply for the BA (Hons.) Music course. What is the tentative date of the entrance test (audition), and will it be held only in Delhi, or in other centers such as Bangalore as well? If I take admission in Kolkata college in BA(Pol.Sc) or BA(Sociology) which perhaps will take place before 27th, can I keep that at the time of admission in a DU college? Am asking cuz I can’t do simultaneously two acts of cancelling my admission in Kolkata and taking admission in DU. This time I am confused to do b.sc or b.a………so can i apply in both b.sc and b.a when filling the form for addmission in du….and later take addmission in one course only…please suggest . Hlo mam/sir, agar mai impovement paper du to meri du me addmission ho skti hai? Reslt me vaise to pass hu…but mai additional subject se pass hui hu jisne mera biology subject cover kiya hai…but mai biology ka improvement paper dena chahti hu.paper dene se phle online registration kra skti hu du me,? we are outstation candidates and we are unable to get help inspite liking the FB page. QUERY – 1 What should we fill in the section of certificate number ?? 2 Do we have to fill in the number of certificates obtained in that particular year ? After completing Bsc(hns) in biomedical sciences, one can do Msc Chemistry or not?? I have filled the DU admission forms but there was no column for the selection of colleges besides for the Sports and ECA category, how will i get a college of my choice. Or is there a section that I missed while filling up my forms ? Sir how to aplly for a correspondence form is it the same form for correspondence also? I have already filled up the registration form……. I want to know that…. At the time of admission shouldn’t I report at college….. As everyone is saying that it is online from this year???? Sir/Mam do i have to self attach my photo before uploading it while filling the DU UG admission form? Sir/Mam DU has not provided me with the fee receipt. How do I know that my fees has been submitted? I only have the printout of the registration form with me! Whether the cut off list for entrance exam and merit based will be declared commonly? I filled DU UG admission form for both entrance and merit. If I appeared in entrance, my candidature for merit based will be affected? I am from Rajasthan Board, My school hasn’t provided the Marksheet & TC ( As they will get from the board at the end of June ) but i have a Signed & Stamped – Provisional Certificate from School . So in this case can i apply to du Admission Process without having BOard Original MArksheet ,TC & MIgration Certificates. st stephens ki mail delete ho gayi ab form no kahan se milega? du ug first cut off list announcement was postponed from 27 to30 of june? anticipating a soon reply. sir/mam, please intimate us about counselling of bcom(h) in du admission for 2016 also mentioned the complete documents list for this purpose. du non collegiate /evening college/ corresspondence mai admission ki date kya hai.? I Am HSC passed Maharashtra board student goted 57% but after my examination I got ill and admitted to hospital so I can’t fill Online form of DU and I wanted to do Bsc in biotechnology…. So is there any option of taking admission in biotechnology in any college of Delhi afflited to DU ..plzzz give ans to my query because I am in so tens about my future studies..
Sir. Can I apply for the subjects I have not filled in the form? I have filled for bsc (hons) courses but now i want to pursue with psychology. kya mai sociology se PG kar sakta hoon jabki graduation mein others subjects theh. If I have not confirm my email address during filling up the form but got the print out of applications form. …..will my registration will be cancelled? ? What is the criteria to apply for BA English Honours distance learning? Please let me know how do I register myself online for the same. i want to know how many colleges are offering MIL in du? WERE RE-REGISTRATION OF DU MADE FOR UG (MERIT BASE) ADMISSIONS ???? FOR 6TH CUT OFF, DIRECTLY AT COLLEGES ???????????????????????????? Sir i scored the marks nearly 78%, can i got any vacaant seat for lifescience in du???? Sir,yesterday on 29-7-16 I take admission in DU (keshav Mahavidyalaya) but I would like to take admission in another university. So may I got immediately my fee which was submitted by me to college and my results. Sir,I’ve applied for two colleges that I want to go to. But I don’t get the seats and now its late to apply for other colleges. What do I do? My % is 62. Sir i want to do m.a mass communication from d.u what should I do for that. I have TC Orginal list but I don’t have 10th 12th Original certificate. how can I apply for UG?